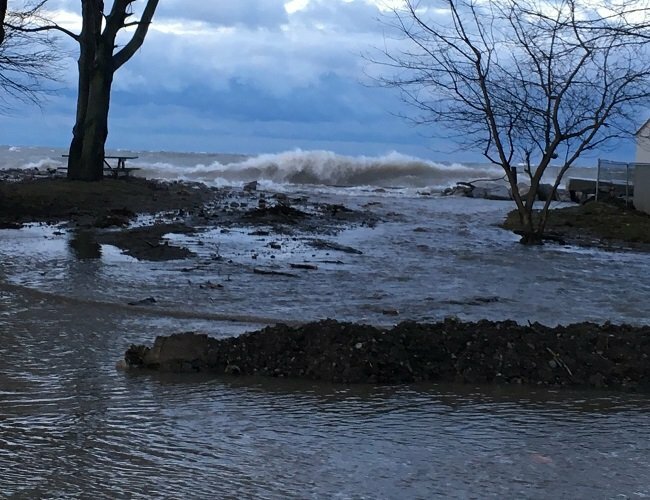 LTVCA – Lake Erie Shoreline and Erie Shore Drive – Watershed Conditions – Flood Outlook – October 19, 2018 – 10:30 a.m.
Strong southwest winds and waves this afternoon through the overnight could cause flooding along Erie Shore Drive and cause shoreline damage all along Lake Erie in Chatham-Kent and Elgin County. Peak winds and waves are expected in the late evening to early overnight period. A Gale Warning has been issued by Environment Canada for Western Lake Erie. Weather forecasts are calling for strong sustained winds from the southwest this afternoon into the overnight period before switching to a more westerly direction. During this period sustained wind speeds above 35 km/hr can be expected. Forecasts suggest wind speeds could reach 55 km/hr in the late evening to early overnight period (with possible speeds of 65 km/hr on the lake). Peak wind gusts could reach 80 km/hr. The Marine Forecast is predicting waves on Lake Erie to be between 2 to 3 m in height during this period. Strong winds will be driving waves onto our Lake Erie shoreline in Chatham-Kent and Elgin County. There is a risk that wave action could damage shoreline protection works and cause shoreline erosion. In flood prone areas such as Erie Shore Drive in Chatham-Kent, flooding caused by waves crashing against the shoreline protection works and spraying water up onto the land is likely to occur if the forecasts hold. Residents along the Lake Erie shoreline should pay attention to weather forecasts and prepare accordingly. This message will be in effect until October 21, 2018.